On my quest for the most minimal footwear possible, I found Luna sandals. What I wanted was open air protection from extremely cold or rough surfaces that I haven’t yet adapted to. There are increasingly more situations where I don’t need my whole foot enclosed due to weather or terrain. The more time my foot skin is exposed to air, the less it is susceptible to cold and the more full enclosure feels uncomfortably hot. Often, in the cold, all I need is something to insulate a bit from the frozen or icy wet ground. After reading a lot of personal experiences on the Barefoot Runners Society forum that got me interested in Luna sandals, I finally had a chance to see some in real life at the Boise Barefoot Run this September. 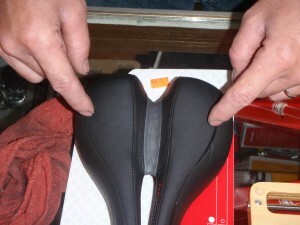 The wearer had owned them a long time and tried a couple of different versions. I was impressed with the flexible, but sturdy looking soles. Not the kind of sturdy that interferes with ground feel, but that holds up with repeated use. I still wanted the thinnest soles I could get, so I ordered the Luna Venados. Their option of “Monkey Grip Technology” looked like the best for a non-slippery foot bed should there be moisture. What I hadn’t thought about was bike riding. 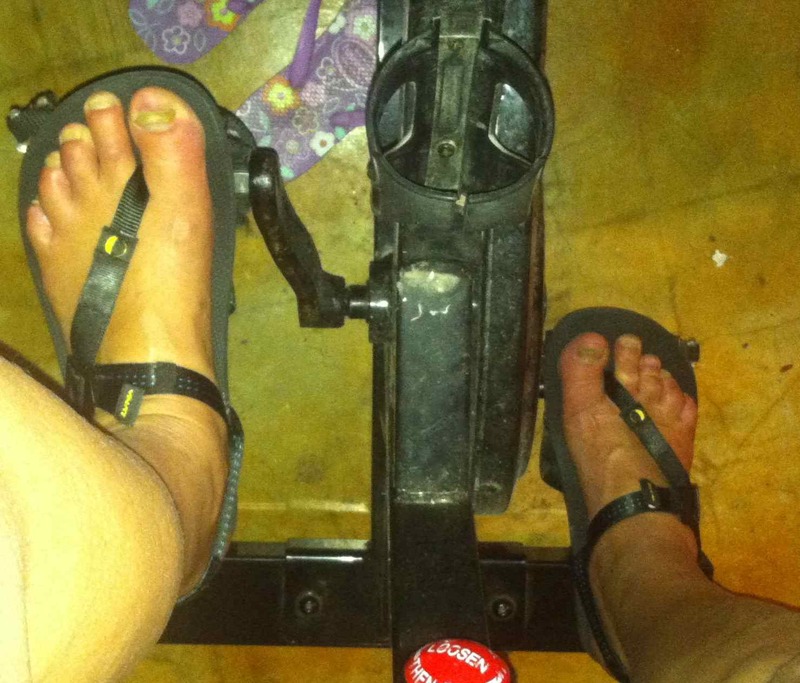 Up until now, I have been riding my spinning bike using flip-flops and my outdoor bikes wearing RunAMocs. Both of these have suited me nicely, but I after test walking around in the Luna sandals for a day, I realized they might be a good option for riding my spinning bike in the basement. 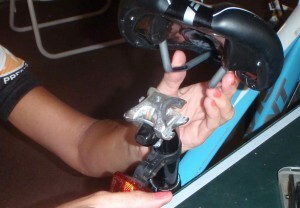 Previous barefoot pedaling attempts had included trying to wrap the spinning bike pedals in rags. These tended to fall apart with the constant motion. 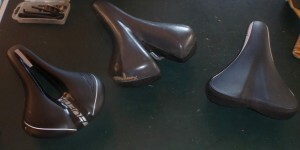 Smoother pedals could have been purchased to replace the spiky originals, but there would still have been ridges and constant pressure points from the spaces in parts of the pedal. 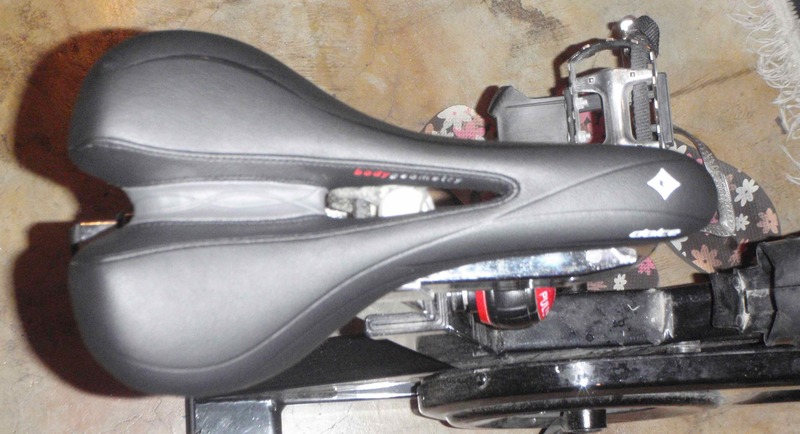 I already know about dealing with pressure points on the pedals. Using the flip-flops had given me the desired flexibility in my foot, along with a more regularly flat surface to push on, but there were some small problems. Wearing the Luna sandals was like strapping something to the pedal, only it was only incidentally attached to my foot instead. 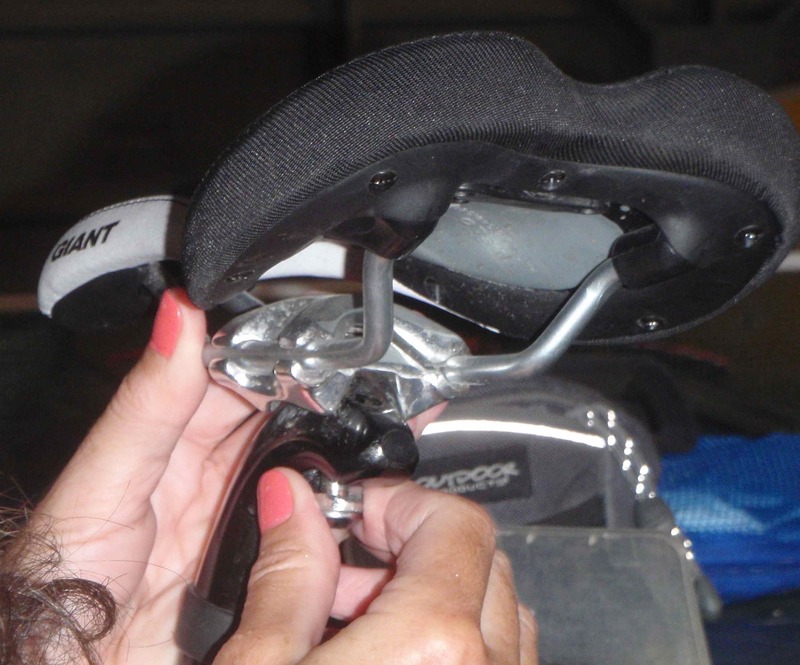 With the flip-flops, I had always had to be careful that the heel portion didn’t slip out of alignment under my foot to catch on the main frame of the bike. It only happened a couple of times, but it was startling when it did. To keep it from happening, I had had to be fairly cautious about adjusting my foot position on the pedals. With the security of the Luna straps (or ATS laces they call them), I could ride without the constant attention to keeping my footwear under my foot. The soles of the Luna sandals closely match the outline of my foot. When I needed to move my foot a bit to fight off some numbness or discomfort from pressure, I could move the foot without worrying about the sandal going in another direction. There was no trouble with slipping off of the pedal, either. The Luna sole seems to have a great balance between friction and maneuverability on the pedals. I rode for 75 minutes at a fast cadence and had no issues with straps rubbing me anywhere on my feet. 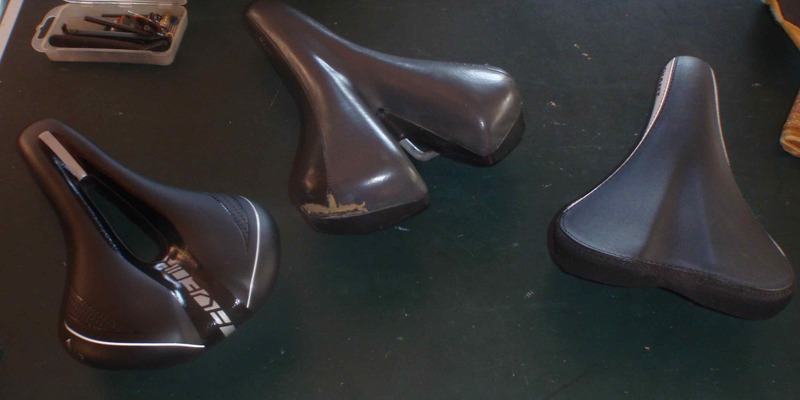 For my outdoor bikes, I have been adamant about wearing fully closed shoes. Now, I am thinking the Luna sandals will allow me to ride “barefoot” outdoors during the summer, too. I’ll have to test how they interact with those pedals, but that might have to wait until warmer weather. Biking tends to create a personal wind tunnel and I get much colder biking at temperatures that I can run in with shorts and a t-shirt. When I run, barefoot is barefoot, so I won’t say I’m running barefoot wearing the Luna sandals. But with the bikes, the sandal is just a modification of the pedal that my foot is in constant contact with. It leaves my foot free and open to the air. Some people say it is boring to use an indoor bike, like the spinning bikes that we have. Fresh air is nice. Scenery can be beautiful. But often schedules, weather, traffic, and even a need to relax while exercising can make using such indoor equipment a good choice. 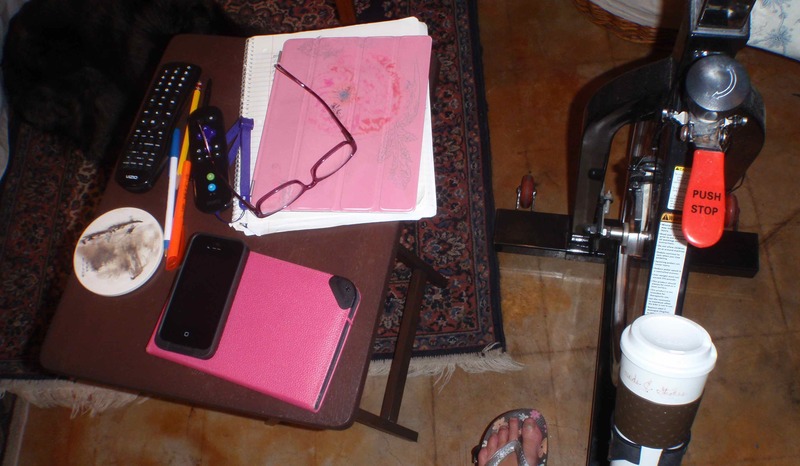 I have been surprised by how many things I have found to do while working up a good sweat on the spinning bike. I often get to more than one thing, as I frequently ride for an hour or more. I seem to always be coming up with new options for myself. I am going to share my ideas specifically, because it is often the specifics that make me think of another thing I can enjoy. I am going to go ahead and list activities that might seem obvious, too. 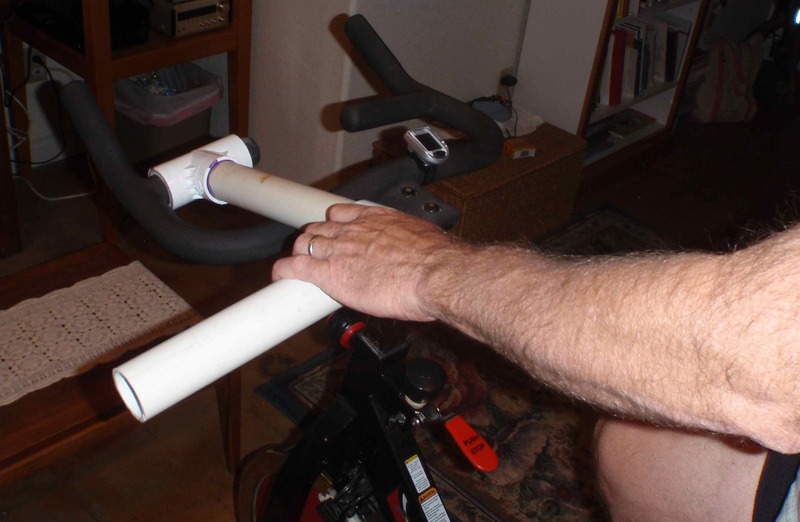 contemplate how my husband might make an iPad rest on the handle bars of my spin bike without interfering with where I sometimes want to put my hands! What do you do when you are on the stationary bike, treadmill, or other similar equipment? A TV tray next to the spinning bike is just the right height and size to keep a few things close without getting in the way of pedaling. My engineer is about 2 months post shoulder surgery for right rotator cuff repair. He still can’t put any significant weight on the arm. His main exercise is his stationary (spinning ) bike in our basement, but he was finding that sitting upright the whole time was uncomfortable. Leaning forward as much as would be needed to use the good arm to hold the normal handle on the bike was risky. 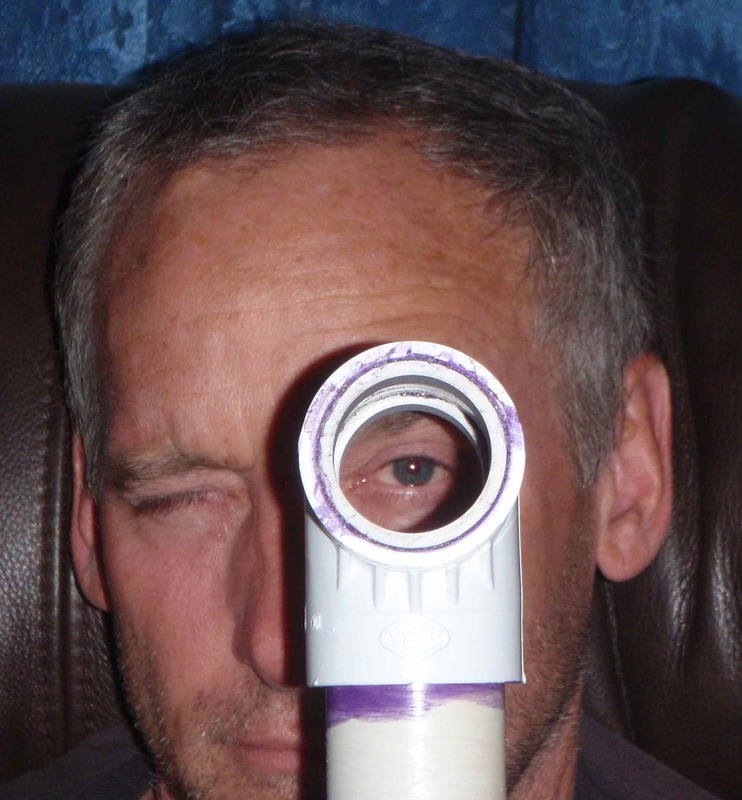 So, he made himself a handle extension out of PVC pipe! First, he sat on the bike and put his hand out in a position that felt like it would work for the handle. 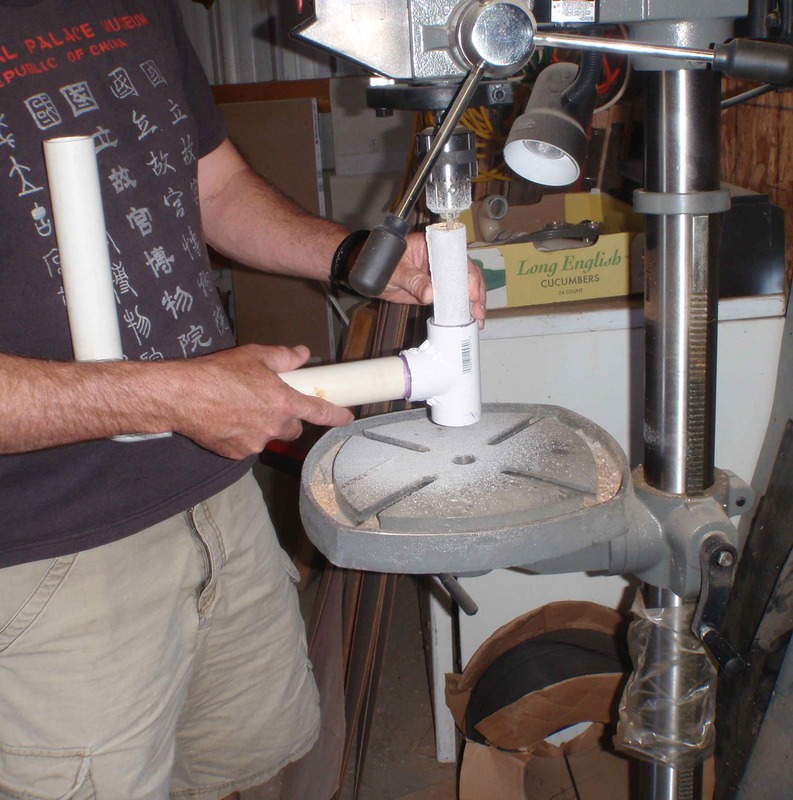 With a table saw, he cut the extending piece of PVC pipe, that piece that would be connected to the T-joint to create that length. (He “made” me use the hand saw when I made the PVC pipe chicken pen…) This piece was glued to the to the T joint on one end and the elbow on the other. 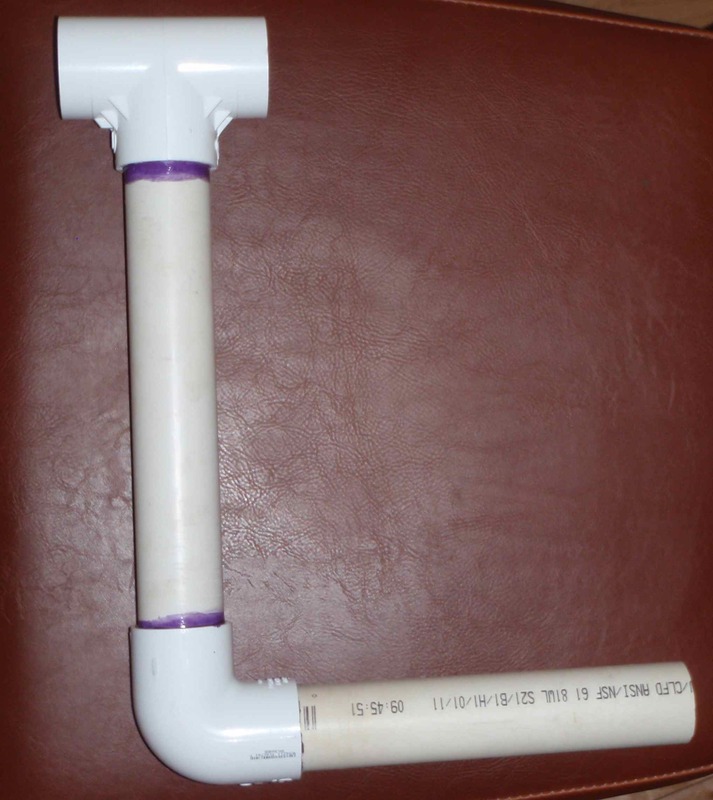 The actual handle, that he would hold onto, was made by gluing a pre-cut scrap of PVC pipe into the other end of the elbow. It could be shorter, but working on all of this with only one functional arm doesn’t inspire unnecessary cutting. 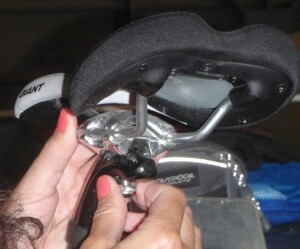 The open section of the T-joint almost fit perfectly over the inner handle of the spinning bike. At first, it was too big, which made it too loose to be a support. So, he glued a PVC bushing inside each end. The T-joint has ridges in it that prohibit putting a solid piece of pipe all the way through it, but in order for it to not rock back and forth, it needed something to keep it evenly on the handle. This modification made the opening just a bit too small. Trying to sand the inside of the bushings was the next step. He cut off the end of an old broom handle. Then, he located an old bolt from his legendary bucket of old bolts and nails. He used a drill bit in his drill press to make a hole in the cut circle end of the broom handle. The old bolt was screwed into the drill press so that he could use the power of the drill press to get it into the broom handle. He left the broom handle -bolt combo in the drill press. 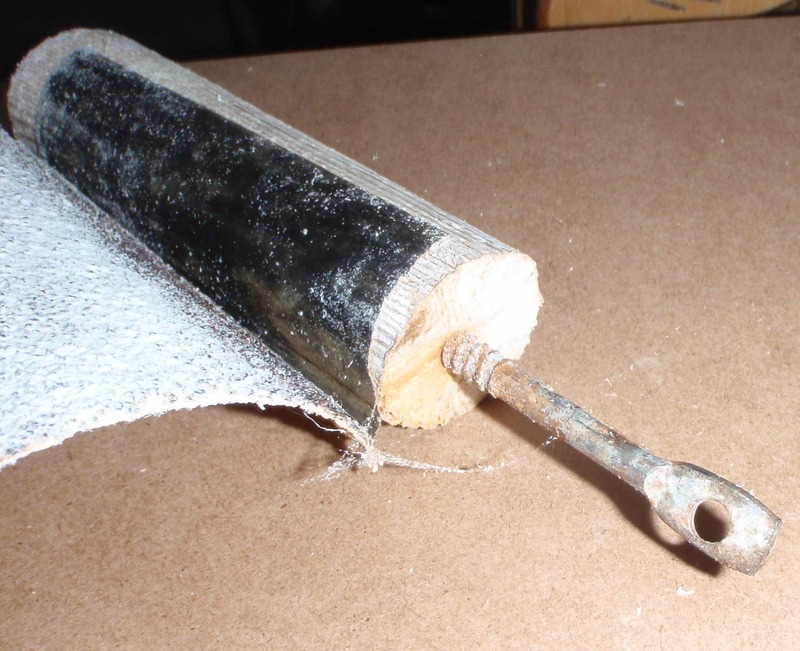 Once this was finished, sand paper was duct taped to the outer cylinder of the old broom handle. The sand paper was long enough to wrap around the broom handle and cover the duct tape. The bushing ends of the PVC pipe were put over the sand paper rod and the drill press was turned on. He assures me that he didn’t use his right arm, but was only holding the light handle there for the photo op. The stationary bike handle extender could fit on either the right or left handle. It still was taking a long time to sand down, but he did it just enough so that it fit tightly onto his bike handle. Oddly, when he used it once on my bike, which is the exact same model, it was enough tighter that it sheared off thin threads of rubber when it was removed. On either bike, it did just what he had hoped, giving him more stability and a better angle for riding. It is not strong enough to put his full weight on, though. It is more a matter of balance. It could be made out of steel, but that would mean using threaded pipe or welding, which was too much work this time. He points out that it could be painted like we did with the adjustable greenhouse lights PVC bar. His injury was a combination of a 20 year old hit-the-ground-while-catching-a-softball impact, followed up with unusually intense ultimate Frisbee last December. But I have heard of cyclist crashing and having the same injury, so this idea could come in handy for frustrated recovering cyclists, too. No one likes to be injured, but it is nice to find ways to make the process go more smoothly.